The westbound partner to The Buck services is the more crowded Barton Stacey. The original restaurant is now abandoned. The forecourt here was known as Drayton Garage (probably Drayton Park at one point) and dates back to at least 1965. Next to it were a series of cottages called Drayton Pump Cottages (named after Drayton Pump Farm). A motorhome park was positioned at the back (also called Drayton Park), which is still there today. The Barton Stacey branch of Little ChefHistory was built behind it in the 1970s, which operated in tandem with The Buck. It looked clearly like a converted house, with external steps up to a staff room on the top floor, and a square area poking out from the front. While it was visible from the road, it was shielded by the petrol station. 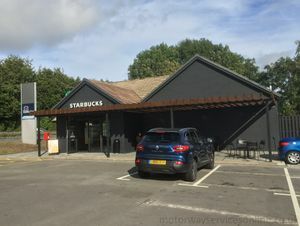 As traffic levels increased, the site became too cramped and in 1986 Fortes and Mobil embarked on a joint project to build a new restaurant and filling station, with the old restaurant becoming a car repair unit. The new restaurant was on the site of the old cottages. 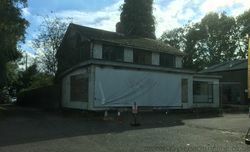 The old restaurant became a car repair unit, with additional sheds being built in its car park. The main reason for the works was that as a busy holiday route, this was chosen as a trial site for Little Chef Lodge, which became Travelodge. The refurbishment upset the Secretary of State for Defence, who had waiting for the services to stop borrowing their sewerage pipe and instead found output increased. The forecourt changed from Mobil to Shell before becoming Esso, who call it Barton Stacey service station. It is operated by MFG. The Little Chef survived many takeovers, but after Euro Garages moved in it became an early casualty and closed in July 2017. It re-opened as a Starbucks shortly after. Meanwhile the old restaurant has fallen into disrepair.